The disaster is also expected to come up at a separate public meeting held by the railroad administration and the Pipeline and Hazardous Materials Safety Administration. WASHINGTON – Representatives of federal agencies and the railroad industry will gather in Washington this week to discuss rail safety in the aftermath of the Montreal, Maine & Atlantic train derailment that killed dozens last month in Quebec. 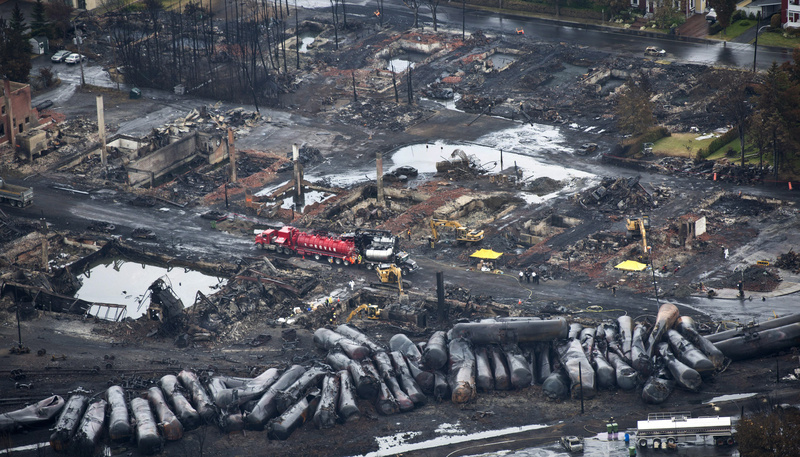 The July 6 accident in Lac-Megantic, Quebec — and what regulatory steps should be taken to prevent another such tragedy — will be the sole topic of an emergency meeting on Thursday of the Federal Railroad Administration’s Railroad Safety Advisory Committee. The Quebec disaster is also expected to come up at a separate public meeting being held by the railroad administration and the Pipeline and Hazardous Materials Safety Administration on Wednesday. Created in 1996, the Railroad Safety Advisory Committee is an attempt by the Federal Railroad Administration to develop safety standards collaboratively, “with all segments of the rail community working together to fashion mutually satisfactory solutions.” The committee’s 54 voting members represent federal regulators, labor unions, railroads large and small, and the industries whose potentially deadly products move via train. Such a regulation-by-consensus approach is, not surprisingly, more popular with regulated industries than directives simply handed down by the government. But critics contend that the consensus approach can be too slow or inadequate to respond to safety issues opposed by the rail industry. It is safe to say the committee has never been called together to respond to a disaster of Lac-Megantic’s magnitude, however. The driverless crude oil train that barreled into Lac-Megantic that morning — derailing and igniting a massive fire that took days to extinguish — killed 47 people and incinerated dozens of downtown buildings. It was the deadliest North America rail disaster in decades. Federal Railroad Administration officials are expected to brief advisory committee members on the preliminary findings of the Canadian investigation into the Quebec disaster. Officials have also directed committee members to come prepared to discuss two key topics, the first being the recent requirement from Transport Canada — the FRA’s northern equivalent — requiring at least two crew members on all trains. Earlier this month, FRA officials strongly recommended two-person crews on U.S. trains but stopped short of requiring them. Yet the agency’s top administer reprimanded the head of Montreal, Maine & Atlantic this past week for continuing to operate trains with a single crew member after the deadly derailment, and the agency made clear in its communication to advisory committee members that it plans to continue to pursue the issue. The other major topic will be the railroad administration’s recent instructions prohibiting railroads from leaving trains carrying certain types of hazardous materials unattended. MMA’s train had been left unattended overnight. Observers shouldn’t expect any definitive policies to emerge from this week’s meeting, however. Robert Kulat, an FRA spokesman, said the advisory committee may refer some of those issues to working groups that will, in turn, issue recommendations to the FRA. The agency can then decide whether to initiate federal rule-making, a process that takes months or years to complete. Apparently even “green” voters in more liberal southern Maine seem to approve of Republican Sen. Susan Collins, according to a poll by a conservation group. The League of Conservation Voters — an environmental advocacy and policy group that endorsed Collins in 2008 — recently polled voters in Maine’s 1st Congressional District about Collins. And the results of the relatively small poll suggest that Collins remains popular among Democrats, Republicans and independents as she heads into her 2014 re-election campaign. Roughly 78 percent of all the respondents and 77 percent of Republicans said they either “strongly approve” or “approve” of Collins’ performance as senator. Eighty percent said they had a “very favorable” or “somewhat favorable” opinion of Collins. That compares to an approval score of 50 percent for President Obama among all respondents and just 19 percent among Republicans. Respondents were then read a series of largely positive-sounding statements about the senator — describing her as a “strong supporter of Bath Iron Works,” and as working to stop budget cuts to programs that protect public health, for instance — and then asked again about their opinion of her. Her approval numbers dipped slightly to 76 percent among all respondents and 77 percent among Republicans. The poll of 400 people over-sampled Republicans, who represented half of all respondents. The margin of error was 5 percent. A regulatory reform proposal put forward by Sen. Angus King, I-Maine, and Sen. Roy Blunt, R-Mo., prompted polar-opposite reactions this past week from outside groups. The bill, the Regulatory Improvement Act of 2013, would create a bipartisan commission to review specific areas of regulations and recommend ways to streamline or eliminate them after soliciting feedback from the public and businesses. Those recommendations would then be presented to Congress for up-or-down votes with no chance for changes. But Ross Eisenbrey, vice president at the Economic Policy Institute, portrayed the bill as setting up a duplicative review system that would force Congress to take up-or-down votes on recommendations offered by potential “non-experts making uninformed decisions in private.” EPI is a think tank that advocates for policies to protect low- and middle-income workers.